The Indigenous People of Biafra under the supreme leadership of Mazi Nnamdi Kanu has described the call made by some ghost and faceless group of hooligans which was published on SUN newspaper on June 1, 2017 as a mere activity of a group of retired but not tired fraudsters who are looking for ways of making ends meet by making unfathomable assertions so as not to return the money suspected to have been given to them by the Nigerian government. The call has been seen as a clear case of fear of the unknown or unforeseen contingencies as a result of the growing harmonisation and coming together of all Biafrans which Nnamdi Kanu is spearheading. It is glaring that the Nigerian government is experiencing serious dis-quietness in the corridors of power as a result of the total resolve of IPOB under the watch of Nnamdi Kanu to restoring the sovereign state of Biafra. As a matter of fact, this call was made by a bunch of uneducated fraudsters few hours after the successful 'Sit At Home' directives given and organized by the Indigenous People of Biafra on May 30th, 2017 in honor of all the Biafran fallen heroes and heroines who laid down their lives during and after the genocidal war being levied on Biafrans by the Nigerian government and her foreign allies between 1967-1970, even till date. The success recorded during the Biafra 'Sit At Home' indeed sends a strong message to the United Nations, United States and the international communities at large, that the people of Biafra are tired of Nigeria and really want to exit from the contraption and have a home to call their own. This no doubt has created a great pandemonium in the camps of the enemies knowing that they have lost the battle because in no distant time, the total restoration of Biafra will take place by Referrendum. Notwithstanding, the Indigenous People of Biafra shall not fold their hands watching these groups of mischievous individuals made up of the Lagos Ibadan express way media syndicates, the so called Igbo group, SEPA or any other groups both mentioned and unmentioned that have continued to publish all kind of junks in the media either on the print or electronic media, but id asking them to desist from that awful activities that is tantamount to causing havoc and uprising in the polity and all over Nigeria. Besides, the act of calling for the revocation of the stringent bail conditions given to Mazi Nnamdi Kanu by Justice Binta Nyako of the Federal High Court sitting in Abuja the capital city of Nigeria is provocative and those involved should stop with immediate effect. Recall that the leader of Indigenous People Of Biafra Mazi Nnamdi Kanu was on April 2017 granted the most stringent bail conditions ever albeit unconstitutional. Some of these bail conditions includes not granting interviews, not conducting press briefings, not leading rallies and not being in a gathering of more than ten persons. It is known that these bail conditions has been wildly criticized and condemned by all well-meaning individuals of the world and the people of good conscience. It was upon the bail conditions stated above that the faceless group made the unwarranted call for the revocation of the bail conditions as being violated by Kanu. However, it is now pertinent to set the record straight by stating the fact that, giving these bail conditions to anybody on bail is violating the person’s inalienable human rights which is as good as not granting the bail at all. 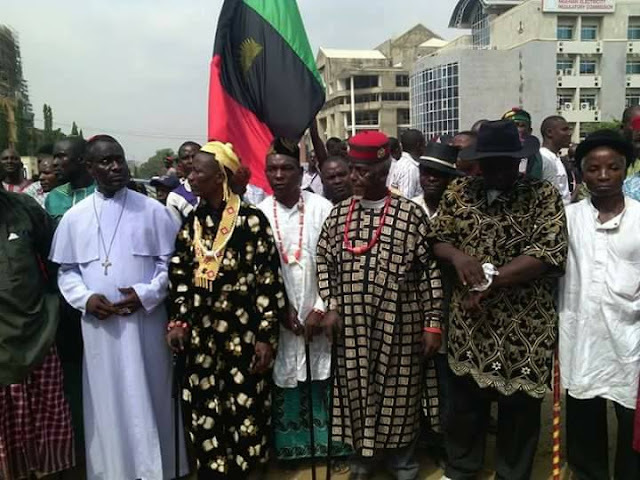 Kanu cannot push away visitors, family members, church members and most importantly IPOB members who are always at his door because court that freed him barred them from visiting, ridiculous indeed. Now, between Nnamdi Kanu and Nigerian government, who disobeys court orders? Recall that in several occasions, the court has granted bail to so many citizens of Nigeria but the Executive arm of government flaunted the court orders for them to go. The case of Mazi Nnamdi Kanu and Sambo Dasuki are cases in point. And I want to ask this faceless SEPA or any group calling for the annulment of Nnamdi Kanu's bail conditions. "Were you not there when it was trending on social media and what was your reaction in that regard? Absolutely Nothing, because you are nonexistent. Finally, the world should be put on notice of the hatched plans by the Nigerian government to rearrests or harm Kanu and also a way to continue committing all sort of crimes against IPOB but the outcome if it finally happens will do no good to anyone. They are bunch of hungry idiots.